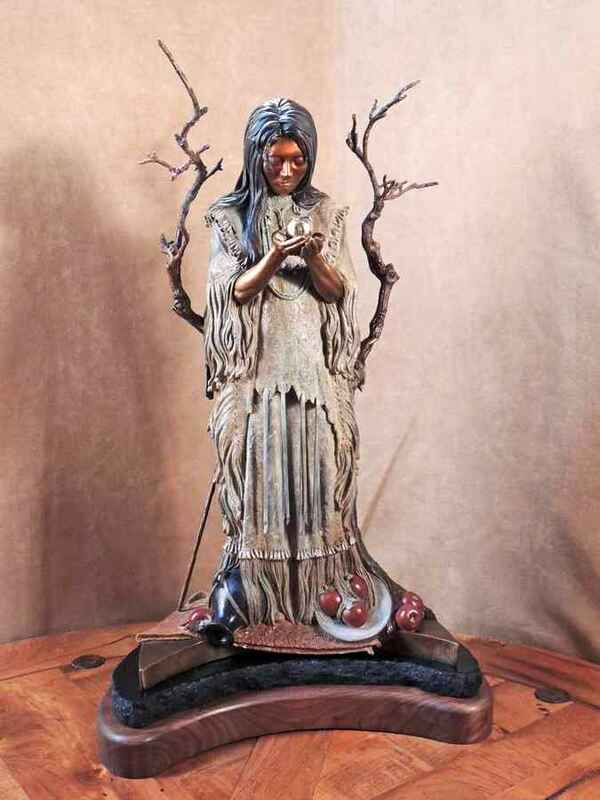 James N. Muir: Sedona Sculptor "En Plein Air"
I recently had the honor of a private and revealing interview with Sedona's Allegorical bronze sculptor, James N. Muir. Sitting in his gallery amongst his works, he paused for a moment of silence before we began. Muir then shared his deepest thoughts on his bronze creations and the relationship between the works. His leather bound book, "Lanterns Along the Path" lie open on the coffee table and I could not help but notice how aptly titled the edition is. 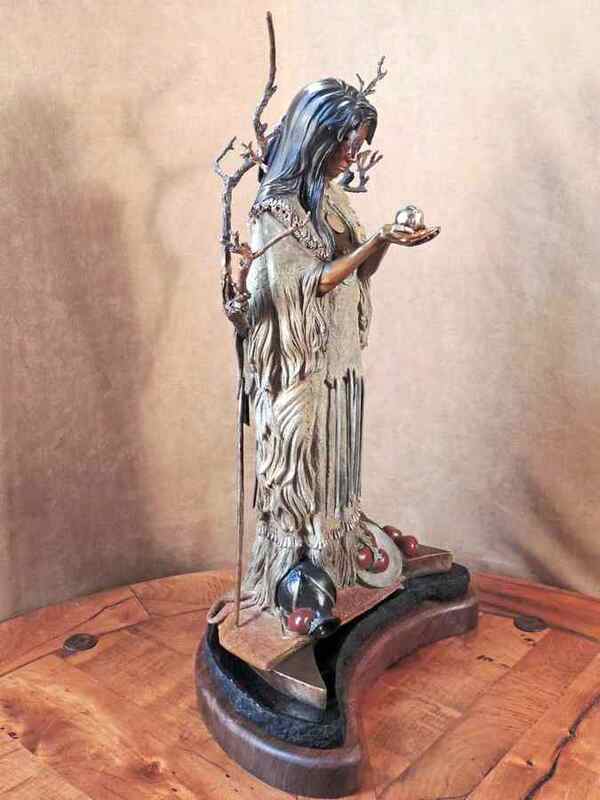 For this largely self-taught sculptor, steps along his journey in life have laid themselves out one at a time, illuminated by his own light from within. 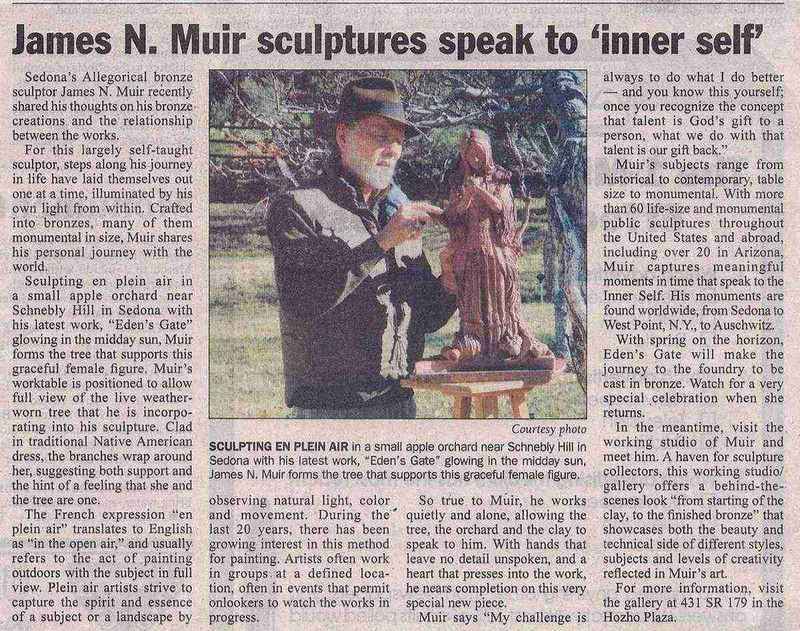 Crafted into bronzes, many of them monumental in size, Muir shares his personal journey with the world. On a subsequent visit, I found Muir sculpting en plein air in a small apple orchard near Schnebly Hill in Sedona. With his latest work, "Eden's Gate" glowing in the midday sun, Muir was forming the tree that supports this graceful female figure. Muir's worktable was positioned to allow full view of the live weather worn tree that he is incorporating into his sculpture. 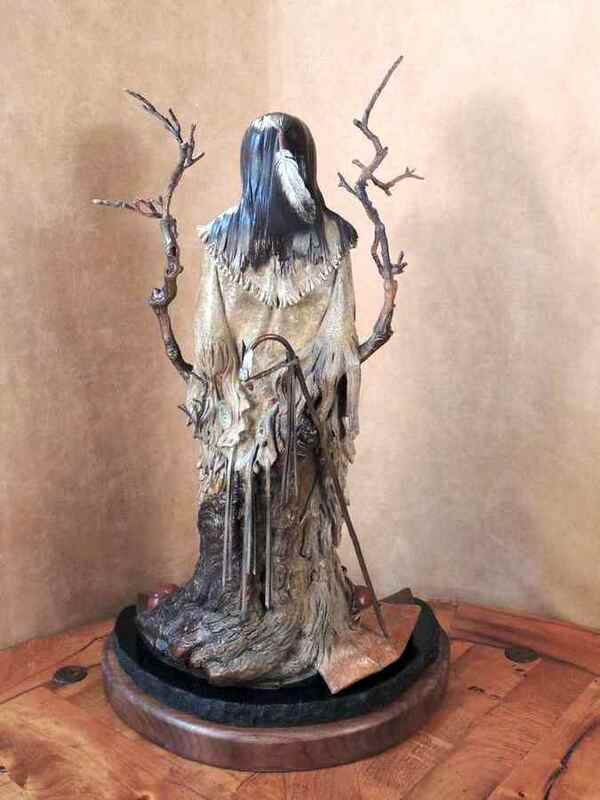 Clad in traditional Native American dress, the branches wrap around her, suggesting both support and the hint of a feeling that she and the tree are "one". As many already know, the French expression En plein air translates to English as, “in the open air,” and usually refers to the act of paint.ing out.doors with the sub.ject in full view. Plein air artists strive to cap.ture the spirit and essence of a subject or a landscape by observing nat.ural light, color and move.ment. During the last twenty years there has been growing interest in this method for painting. Artists often work in groups at a defined location, often in events that permit onlookers to watch the works in progress. So true to Muir, however, he works quietly and alone, allowing the tree, the orchard and the clay to speak to him. With hands that leave no detail unspoken, and a heart that presses into the work, he nears completion on this very special new piece. I comment at the sculpture's beauty and Muir replies, "My challenge is always to do what I do better. And you know this yourself; once you recognize the concept that talent is God’s gift to a person, what we do with that talent is our gift back." I recall his words from our earlier interview; "I would probably describe myself as a storyteller, a spiritual storyteller. A storyteller of our spiritual journey to our ultimate and inevitable destination. And so, a number of pieces do tie in as being another lantern, but farther down the path that I've been traveling; and how it connects to previous lanterns, and points toward the next one to be looked for even farther down the path, around the bend, over the mountain." Muir’s subjects range from historical to contemporary, table size to monumental. With more than sixty life-size and monumental public sculptures throughout the United States and abroad, including over twenty in Arizona, Muir captures meaningful moments in time that speak to the Inner Self. His monuments are found worldwide, from Sedona to West Point in New York, to Auschwitz. With spring on the horizon, "Eden's Gate" will make the journey to the foundry, where she will be cast in bronze. Watch for a very special celebration when she returns. In the meantime, visit the working studio of James N. Muir and meet the artist!